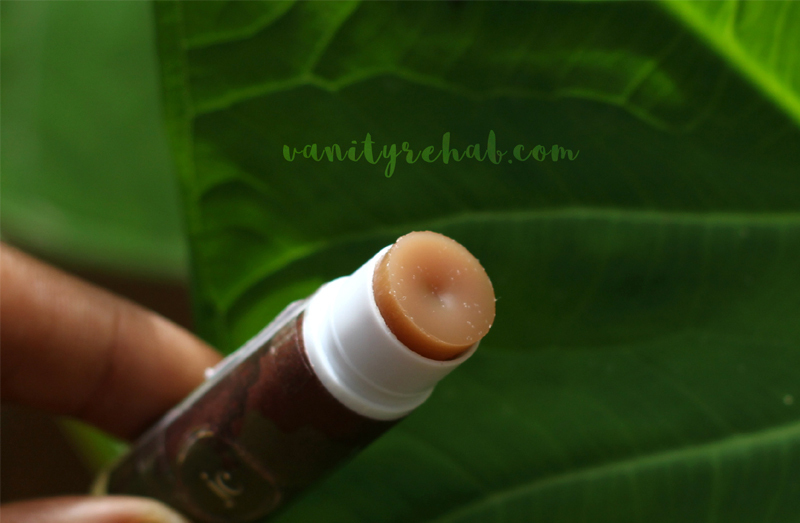 Vanity Rehab: Juicy Chemistry Choco-Mint Lip Butter Review. 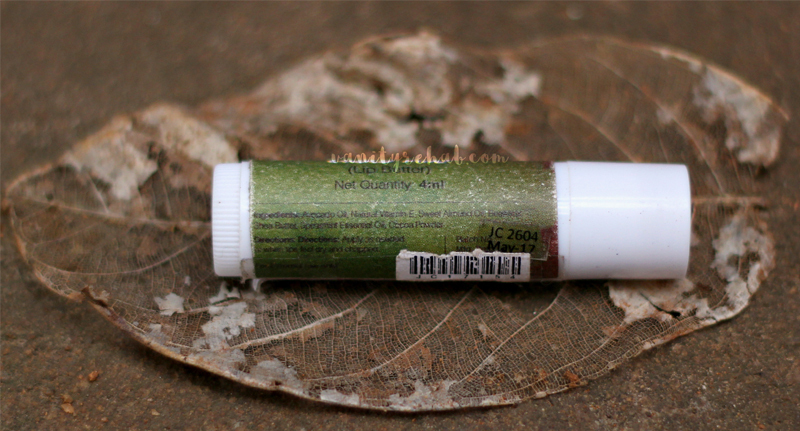 Here is the Review of one of my Most Favourite Lip Balms after the Dr.Hauschka's Lip Care Stick. 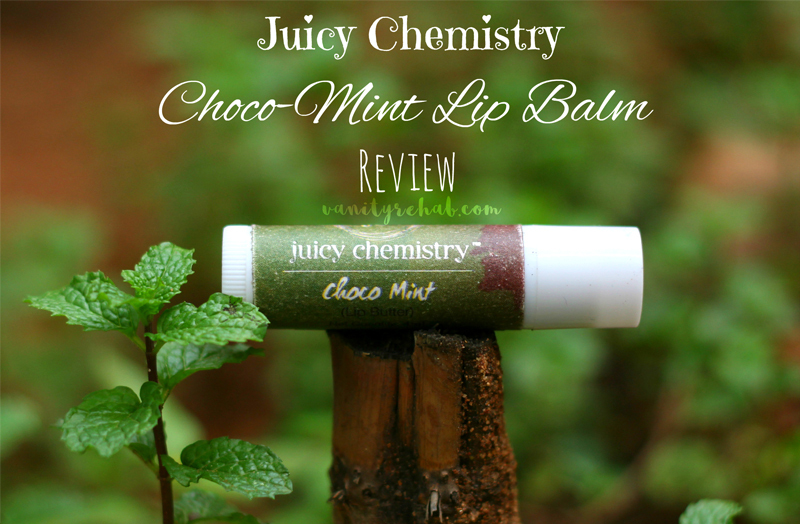 The Juicy Chemistry Choco-Mint Lipbalm. Read on to know why i love it so much. Ingredients: Avocado oil, Natural vitamin E, Sweet Almond oil, Beeswax, Shea butter, Peppermint essential oil, Coco powder. In the Background: That's my jack fruit leaf that has started decaying but with it's Leaf Skeleton Network still intact. Beautiful it was! Looks Brown but, doesn't give any colour whatsoever. In the Background: Fresh Colocasia leaf/Arbi ka patta in my Backyard. I was in desperate need of a lip balm last winter and i started searching for a heavily moisturizing one because my lips were almost tearing up! So i looked up online for reviews and found out that the juicy chemistry lip balms were some of the best. But, out of that desperation, i bought this Choco-Mint lipbalm in the wrong season! Because this lip balm, as much as it moisturizes, that much it freezes too! Yes, it almost froze my lips! Meaning, it is that 'Strongly Minty'. This could've happened because my skin has become really sensitive. But, it is Amazing Amazzzing Amazzzzzzingly moisturizing! I only had to Re-apply once during the whole day. And it smells Delish! Final words: Seriously the best moisturizing Lip balm i've used after the Dr.Hauschka's Lip care Stick. Have you used this variant of juicy chemistry lip balm? how was your experience? Do share with me in the comments section below. Your photos are a class apart ! I wish they tone it down a bit.